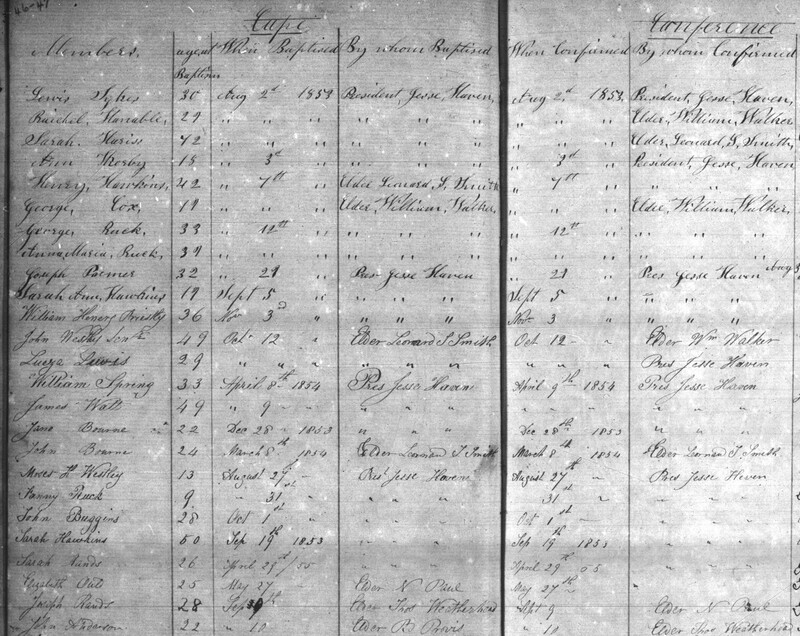 While Haven failed to record in his journal the names of the two “colored women” that he baptized, he did record their names in the baptismal log he kept. In that official account he made no indication as to the racial identity of the people who converted to Mormonism. It is only through combining what we learn in his journal with the official “Record of the Cape Conference," that we learn the identity of the two "colored women". One woman was Raichel Hanable and the other was Sarah Hariss. Haven recorded very little biographical information about those who converted in South Africa. He only noted their age at the time of baptism (Hariss was 72 and Hanable was 29), the date of their baptisms and confirmations, who performed both rituals, and what LDS “branch” organization the new proselytes belonged to. In the case of Hariss and Hanable, they attended the Newlands, Cape Town branch. In the afternoon went to Newlands. Called to see sisters Rainer and they both told me that they wished to have their names taken off our books. Sister Watt said the same. The Israelite has been there and convinced them that the doctrine he preaches is correct. He preaches we must keep the law of Moses. I called on three colored women sisters, one only was at home. She said, she wanted her name taken off all also . She also said she thought her daughter would want hers taken off also likewise. In the evening I preached at br Bourn’s. Spoke on the Book of Mormon. Jesse Haven, Journals, 1852-1892, MS 890, Church History Library, Church of Jesus Christ of Latter-day Saints, Salt Lake City, Utah. Record of the Cape Conference, CR 375 8, box 6498, folder 1, image 13, Church History Library, Church of Jesus Christ of Latter-day Saints, Salt Lake City, Utah. Jesse Haven, Journals, 1852-1892, 2 August 1853, MS 890, Church History Library, Church of Jesus Christ of Latter-day Saints, Salt Lake City, Utah. Jesse Haven, Journals, 1852-1892, 15 September 1854, MS 890. Record of the Cape Conference, CR 375 8, box 6498, folder 1, image 13.